Can You Figure Out How To Beat Roger Federer At Wimbledon? Mull it over on your commute, dissect it on your lunch break, and argue about it with your friends and lovers. When you’re ready, submit your answer using the link below. I’ll reveal the solution next week, and a correct submission (chosen at random) will earn a shoutout in this column. Important small print: To be eligible, I need to receive your correct answer before 11:59 p.m. EDT on Sunday — have a great weekend! Before we get to the new puzzle, let’s return to last week’s. Congratulations to 👏 Adam Kalinich 👏 of Glen Ellyn, Illinois, our big winner. You can find a solution to the previous Riddler at the bottom of this post. Now here’s this week’s Riddler, a centre court tennis puzzle that comes to us from Ted LeMoine, a professional poker player from Medford, Massachusetts. Extra credit: It’s been a while, so let’s offer up a 🏆 Coolest Riddler Extension Award 🏆. Improve your tennis skills, make more realistic assumptions (about serving, etc. ), or something even more creative. The winner gets a shiny emoji trophy next week. And here’s the answer to last week’s Riddler, concerning a robot that slices your pizza, randomly and independently chooses two points on the pie’s circumference, and then slices along the chord connecting them. If you ask the robot to make three such cuts, you can expect your pizza to have five pieces, on average. Thanks to the way the robot randomizes its cuts, each scenario above occurs with equal probability. Therefore, the average number of pieces is (5*4+6*5+3*6+1*7)/15 = 75/15 = 5. For the more engineering-minded Riddler solvers, Gabe Pezanoski-Cohen put together a little pizza robot simulator that can make any number of cuts. 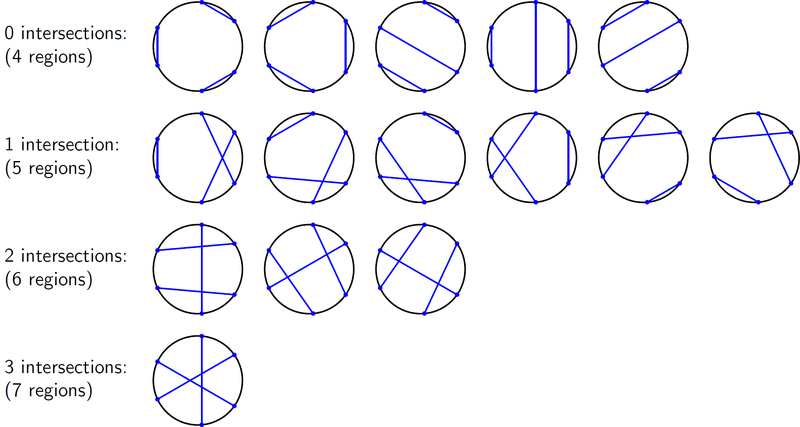 There is also an elegant generalized solution: If the robot makes k random cuts, the expected number of slices is (k+2)(k+3)/6. As the puzzle’s contributor Zach Wissner-Gross explains, this can be shown by induction: If the expected number of pieces resulting from k cuts is E(k), then the expected number of pieces for k+1 cuts is E(k+1)=E(k)+1+k/3. Why? Slicing along a new random chord will always add one slice, and the new chord has a one-third chance of intersecting each of the already sliced chords. Combining that with the fact that one cut gives two pieces, or E(1)=2, we arrive at the generalized solution. Mmm, pizza.